I’m a huge James Wong fan; I now own all his books (thanks to James’ wonderful publishers who kindly sent me his new book which will be realised worldwide later this week). 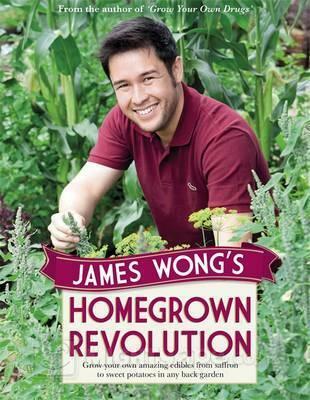 James Wong’s previous books are both about growing your own drugs; ie making your own natural remedies. His new book is a new twist on a topic that is a huge passion for many people; our gardens. With so many garden books out there it truly takes a special book to become the number one gardening book in the UK without even being released yet!! James’ new book is called Homegrown Revolution and I think the title almost speaks for itself. This book is super easy to read and I love all the little stories that James adds so that you feel a part of his revolution. This is not just another gardening book about how to grow potatoes and other run of the mill crops but is a true eye opener for the something different, exotic and never thought of or forgotten plants. Homegrown Revolution like James’ other books are just beautifully presented and a true pleasure to read and look at. I have learnt so much about the plants I already have in my garden and about all the new plants I want to grow. This book will be enjoyed by beginner gardeners and people who have been gardening their whole lives. I think everyone will learn something new for instance did you know that Dahlias are actually yams and Fuschias have edible berries! I will be returning again and again to this book to read how to grow a huge variety of plants and to make the remedies and wonderful recipes contained within the pages. I love that there are one or several pages on each plant plus beautiful pictures that tell you how big the plant will grow; where they grow best, how frost tender they are and also how easy they are to grow. My conclusions; I really hope there is a sequel to this book and I think we have to move as I want to grow SO many of the plants mentioned in this book. Thanks James for opening my eyes to a whole new world!